Nebraska’s annual Red-White Spring Game will take place Saturday at Memorial Stadium, with kickoff set for 1 p.m. The game will be carried live on the Learfield/IMG Husker Sports Network and televised live to a national audience on BTN. The spring game sold out in less than a week in February. With a capacity crowd expected, fans are encouraged to arrive early and consider the reminders below. The following information should be of assistance for those planning to attend Saturday’s game. 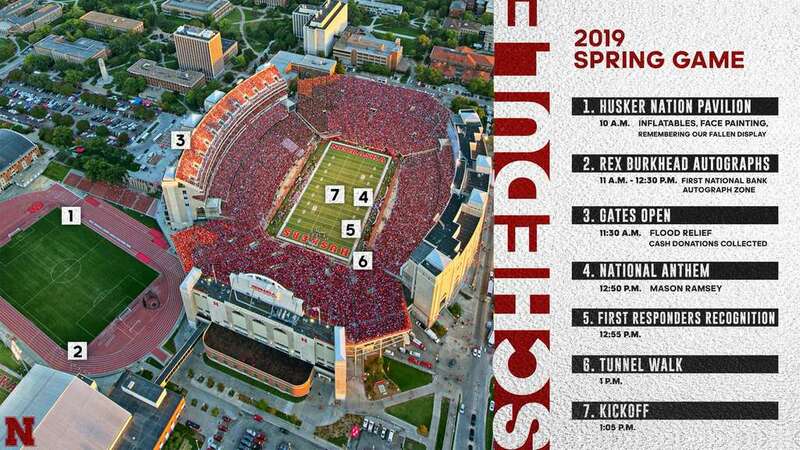 Regular-season Memorial Stadium policies will be in place for fans attending the Red-White Spring Game, including Nebraska’s Clear Bag Policy. Fans are also reminded that open umbrellas are not allowed inside Memorial Stadium. Fans attending the game may visit www.huskers.com/gameday for more information. The University of Nebraska is a tobacco free campus. The policy is posted at www.unl.edu/tobacco-free-2018. STARTRAN will be providing shuttle service from South Pointe Pavilions (27th and Pine Lake) and North Star High School (5801 No. 33rdStreet). Buses will park in close proximity to Memorial Stadium. Shuttles begin at 9 a.m., and cost is $5 per adult each way and $5 round trip for kids (10 and under). The shuttle service begins at 11 a.m. The Remembering Our Fallen display will be set up near the East end of the Pavilion area. This one-of-a-kind display is presented by Patriotic Productions and is an all-encompassing national memorial that includes our country’s military Fallen who have died from wounds while deployed in The War on Terror since September 11, 2001. This beautiful display consists of 31 Tribute Towers supporting double-sided and full-color banners made to withstand the elements. The Marine Corps Cornhusker Detachment will assist with setting up the memorial and will stand guard at the Pavilion on Friday night. Gold Star Families will attend the game and will be honored as a group at the game. The display will open at 10 a.m. on Saturday when the Husker Nation Pavilion opens to the public. Nebraska Athletics would like to encourage all Nebraskans to help in the flood relief efforts. The Red Cross, Nebraska Athletics, N Club letterwinners and student-athletes will collect cash donations inside all entrances of Memorial Stadium when the doors open at 11:30 a.m. until 12:50 p.m. giving Husker Fans time to get to their seats before the Tunnel Walk. Fans are asked to have their donations ready for the bucket collection upon entry in order to assist with getting fans to their seats inside the stadium.